I hope your concert band season is off to a great start! 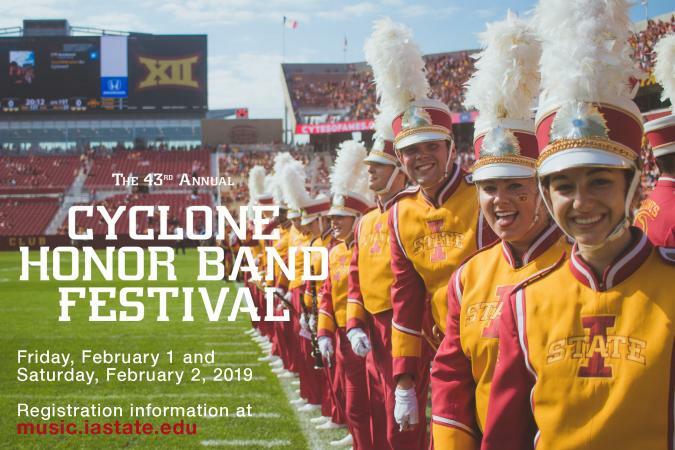 Below are the application materials and information for our 2019 Cyclone Honor Band Festival. Please nominate your most deserving students to participate in this superb event. The exceptional conductors, combined with our clinics and ISU Wind Ensemble concert, will provide a truly first-class weekend for you and your students! 1. Complete the band director information in the middle of each entry form (for each of the Gold and Cardinal Band forms). 2. Print the Gold Band Entry Form for as many students as you’d like to nominate. 3. Print the Cardinal Band Entry Form for as many students as you’d like to nominate. 4. For students whose names you are submitting for the Cardinal Band, please prioritize your nominations by numbering them. You’ll find a space for an application number in the bottom left corner of the entry form. Should you nominate someone for the Gold Band and we are unable to place that student into the Gold Band, that student would automatically be a higher priority than your first choice for the Cardinal Band. You can mail the forms, scan and send, or fax the Entry Forms back to us. Please do not ask us to allow your students to miss any part of their honor band rehearsals. However, if you have a student who is participating in the IHSA State Speech event, that student will likely be able to do both – as long as they request a special time to perform and they are at a nearby site. The IHSA will gladly accept your request, as we are also a “school-approved” activity. However, know that they will not be able to move your speech students to a different site. Thanks in advance for your support of this event. We are excited to be hosting this event and appreciate your support and participation. Please don’t hesitate to contact me should you have any questions or concerns.